Meet Mr. Mango Man. He is dancing a jig for you. Oh yes, I do love mangos! 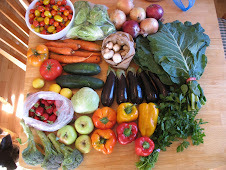 99% of the time, I just eat whatever fruit is available at the farmers market. This time of year that means oranges, plums, apples galore, and the last few strawberries. But, every once in a while, I walk past some exotic fruity delight at the grocery store and I just can't stop myself. Mangos have a special draw for me, I just love them so much. 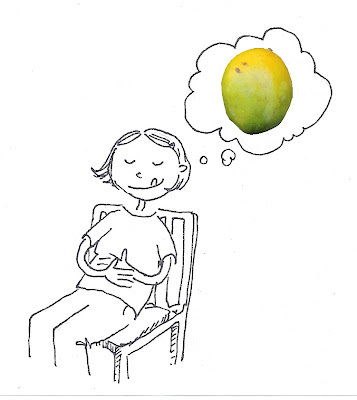 In fact, one of my big goals in life is to go to a mango climate during mango season and gorge myself on daily mangos. It will happen. I saw this beautiful mango - grown right here in California apparently! - at a grocery store yesterday, staring up at me with it's tropical glory, and I couldn't resist. 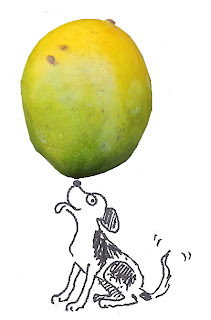 Snoopy is balancing a giant mango on his nose! I peeled the mango with a paring knife, and cut off the sides. This awesome mango was exactly perfectly ripe, AND it had a tiny little pit. That's pretty much mango perfection, as far as I'm concerned. All sliced up and ready to eat. I know you can put mangos in smoothies and muffins or whatever, but when a fruit is perfectly ripe, it's already heavenly all on its own. You know? Here I am, relaxing in a state of post-mango bliss. 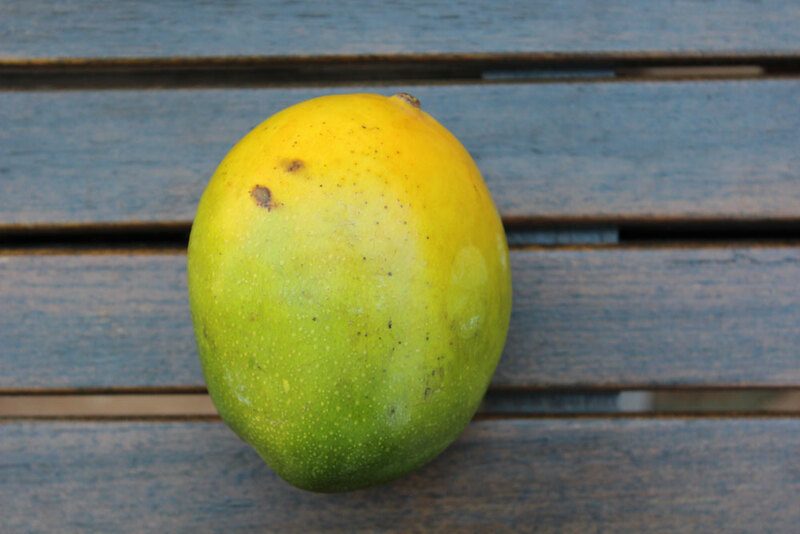 I love mangoes, but I'm with you we usually buy what's at the FarMar. When we were in Jamaica, we napped in a mango grove. A woman approached us with a big stick, and I got a little worried, but she was just after a few mangoes out of reach, not our bums. I want to sleep in a mango grove. It sounds like heaven on earth. Except for the lady with the giant stick! Getting fancy with the illustrations! I love the photo/cartoon combo ... a whole new medium. I am with you--mangos are SO worth the non-local/seasonal splurge. 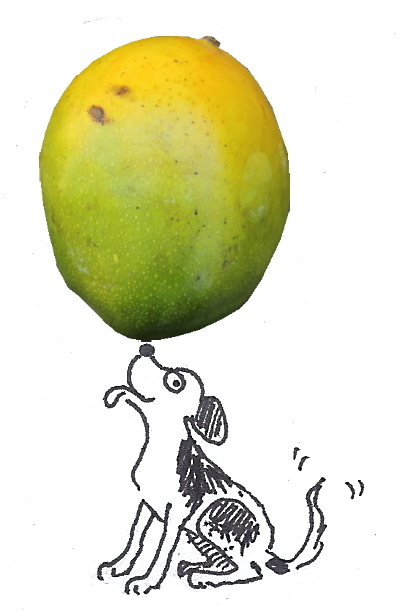 I have the same goal--gorging on mangos fresh from the tree sounds like heaven! I have to admit that I'm not the hugest mango fan but I think that's only because the ones we can get here are nowhere near local or seasonal. If I'm ever somewhere I can get a lovely fresh mango I'm gonna be all over it! :) sometimes keepin' it easy is the way to go. I have been to such a place. It's just as good as it you think it's going to be... I ate a truck-ton of mangoes. I thought I'd get bored of all those fresh-as-a-daisy mangoes. You know what? I just wanted MOAR! oh joey, I am drooling!!!! It sounds like paradise... someday! great idea River!!! Yummers hasn't made much of an appearance this mofo season (in doodle form) . Shame on me. 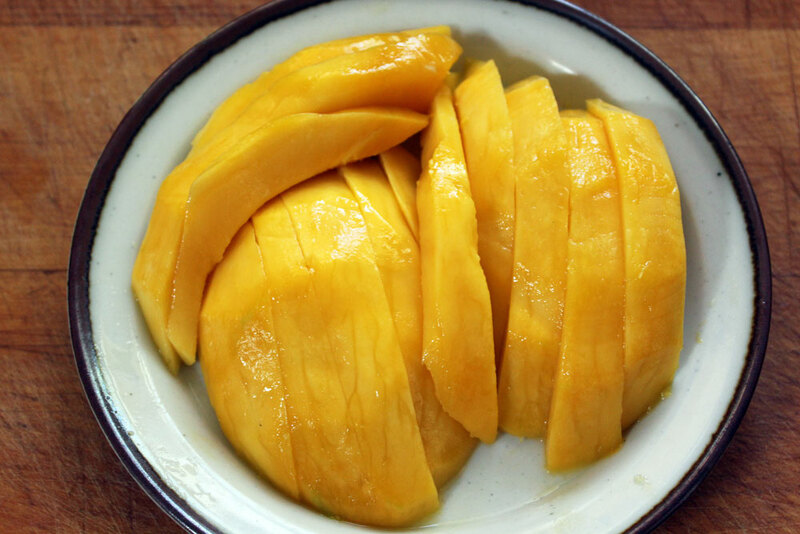 omg yes i loooove mangos! 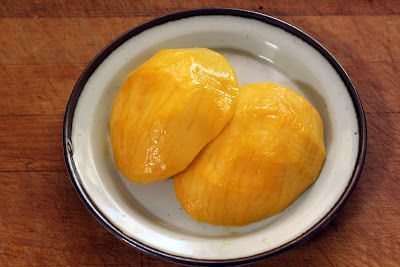 i remember the first time i ever had one i was in the bahamas on a disney cruise and there was a little stand on the beat selling halved mangos all cut up ready to eat. i cant even remember how many times i made my dad go make and buy me more. then finally he came back and told me i ate the last mango on the island! ever since then i was mango hooked! 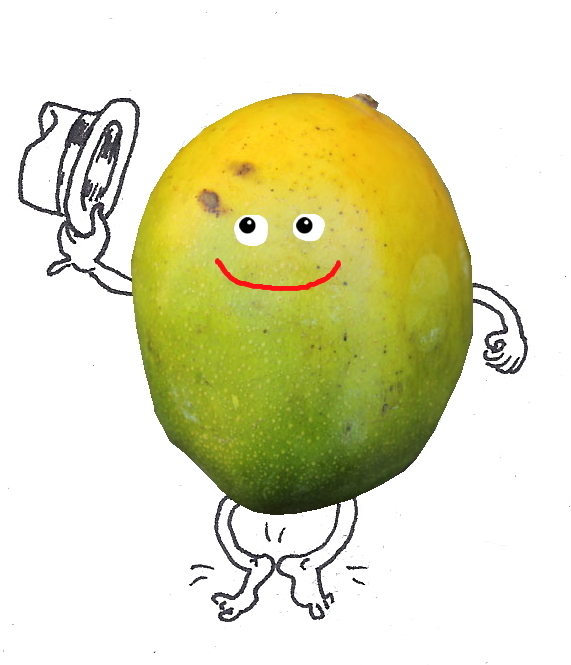 ha ha - you ate all the mangoes in all of the Bahamas! Well done! I adore mangoes! Unfortunately, I'm very allergic to their skin so I only eat them when I can sweet-talk someone into peeling them for me.